An Italian-led team of astronomers used the MUSE (Multi-Unit Spectroscopic Explorer) instrument on the Very Large Telescope (VLT) at ESO’s Paranal Observatory in Chile to study how gas can be stripped from galaxies. They focused on extreme examples of jellyfish galaxies in nearby galaxy clusters, named after the remarkable long “tentacles” of material that extend for tens of thousands of light-years beyond their galactic discs. 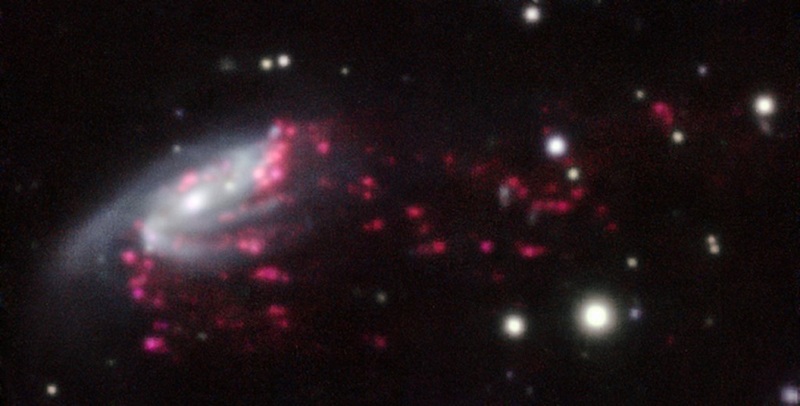 Six out of the seven jellyfish galaxies in the study were found to host a supermassive black hole at the center, feeding on the surrounding gas. This fraction is unexpectedly high — among galaxies in general the fraction is less than one in ten. A long-standing question is why only a small fraction of supermassive black holes at the centers of galaxies are active. Supermassive black holes are present in almost all galaxies, so why are only a few accreting matter and shining brightly? These results reveal a previously unknown mechanism by which the black holes can be fed.